With London fashion week fast approaching we are looking ahead to Spring / Summer 2020 which will be showcased in September throughout the city. LFW sees many people from the fashion industry gather together to see the latest collections on the runway, through creative presentations and during busy Press days! We have collated some of the very best LFW ready venues can work for various forms of product presentations. Thirty-Eight Grosvenor Square occupies an elegant Grade II listed Georgian townhouse on one of London’s most desirable and prestigious areas. Situated a 2 minute walk from Bond Street underground station, this space offers exceptional classic proportions, white walls throughout, high ceilings, original artworks from the early 18th century and a lovely courtyard. 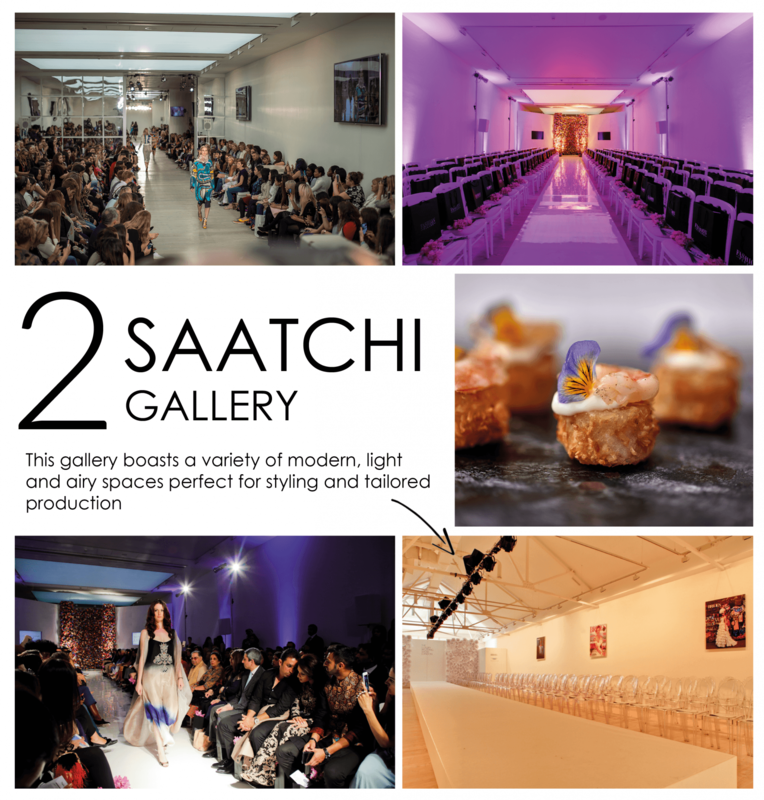 Unlike many venues Saatchi boasts nine spacious gallery rooms averaging 23.9m x 8.3m x 4.0m and catering up to 1,500 people! This venue also features two smaller rooms perfect for intimate press dinners, press day meetings and B2B networking events. 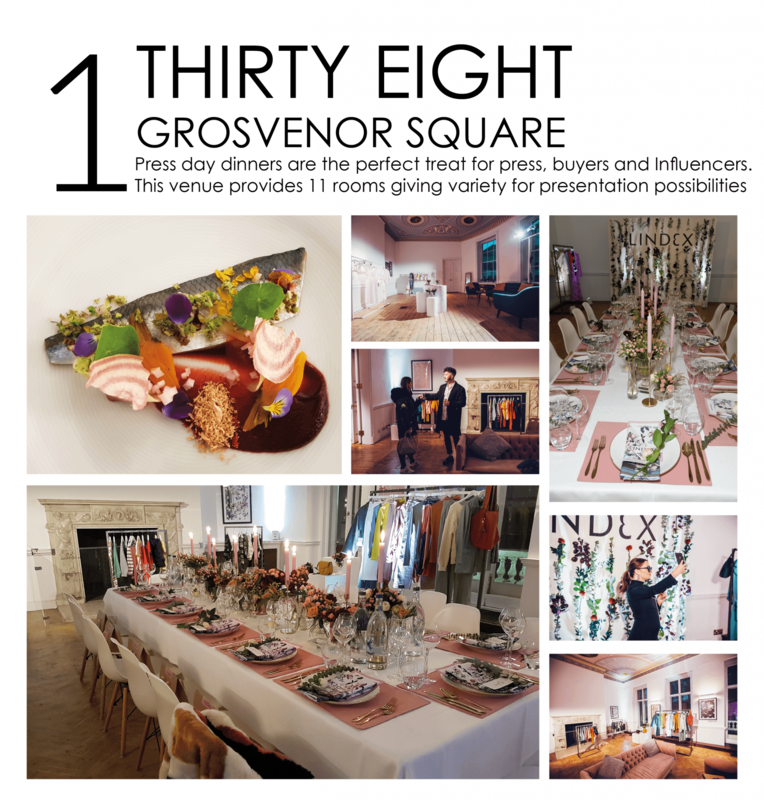 OXO2 has welcomed many fashion events, talks and press launches through its doors. This venue is located in the heart of London boasting two spacious, neutral and versatile rooms making it perfect for brand styling and various production setups! The location of this venue provides guests with breathtaking views across the Thames and is perfect for commuting due to its close proximity to Blackfriars, Southwark and Waterloo stations. The Royal Horticultural Halls' biggest space the Lindley Hall allows plenty of natural light into any event with its breathtaking dome roof. The high ceiling and glass roof allows for endless lighting possibilities and high production structures. Alternatively, The Lawrence Hall provides space for up to 1,500 standing guests, featuring stunning architecture! 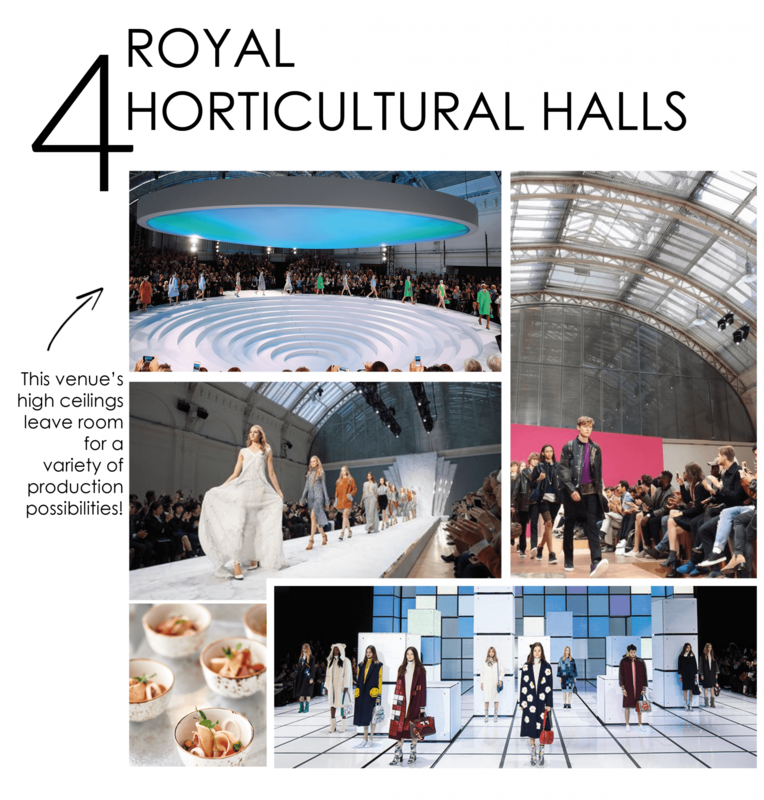 The venue is spread across 8,000 square feet and can cater to fashion shows throughout the whole venue or in separate rooms as all three rooms lead into the central foyer. Unlike many other venues Studio Spaces three rooms showcase different styling possibilities, such as The Warehouse that sports exposed brickwork and polished concrete floors or The White Studio with clean walls and large windows facing out onto the traditional cobbled streets of East London. Old Billingsgate has hosted many fashion events over the years catering to some of the UK's best designers! This stunning venue can cater for large fashion shows in The Grand Hall with a capacity of up to 2,500 people, The Vault is perfect for 700-900 people and The Gallery at the top of the building that can host up to 350-500 people.